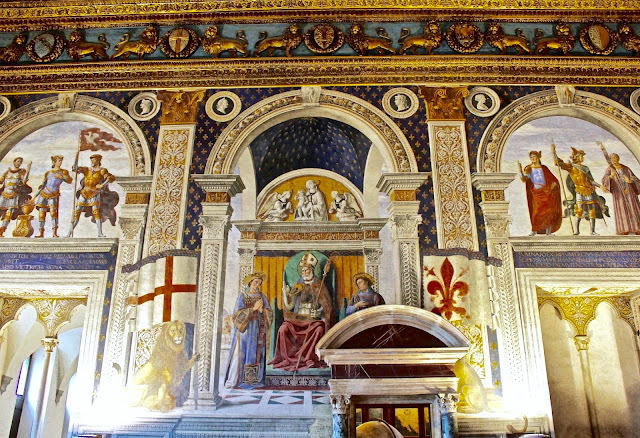 The Roman Anglican: A magical chamber: the Sala dei Gigli in the Palazzo Vecchio. A magical chamber: the Sala dei Gigli in the Palazzo Vecchio. The Palazzo Vecchio in Florence, which has been the home of the secular power of Florence since its rise in the late Middle Ages hosts several art treasures that represent all the styles in which Florentine masters excelled, Florence has always been the heart of the Renaissance and so I think it is important to analyse the chamber that better represents this style in a glorious way: the Sala del Giglio. 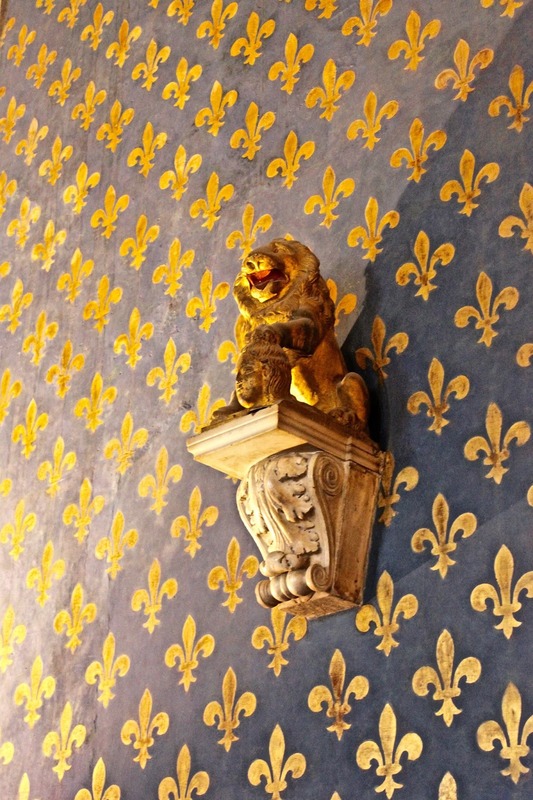 The name of the room derives from the word giglio (fleur-de-lys), symbol of the French crown, which is different from the Florentine one for the absence of stamens, and the blue/golden colours as opposed to red/silver as in the Florentine coat of arms. 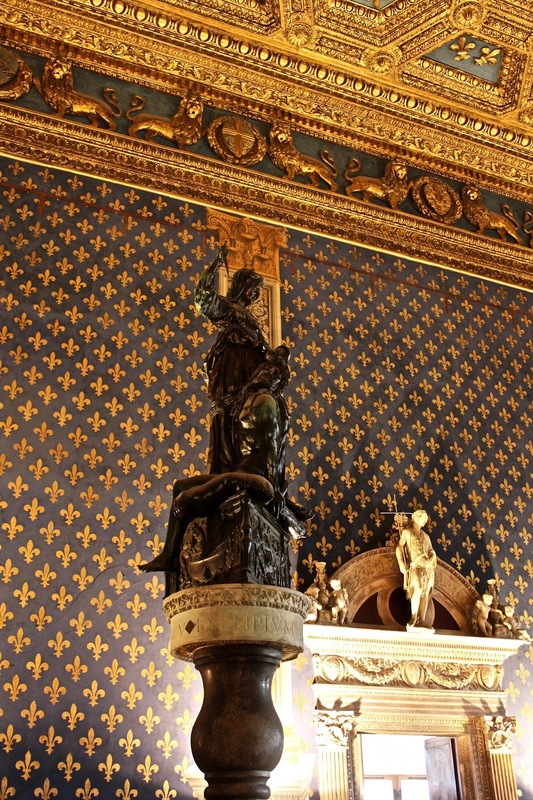 The decoration was given in honour of France, that at the time was seen as the defender of Florentine freedom. The story of the decoration of the room is even more fascinating though. 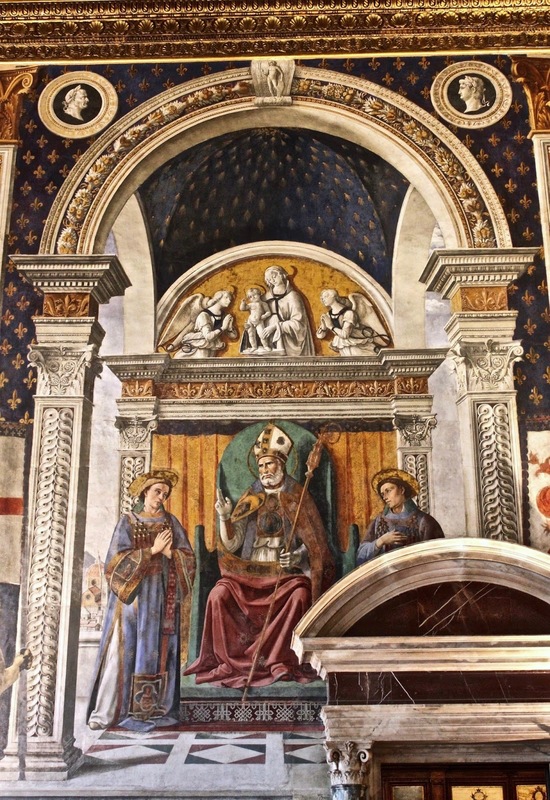 The chamber was created by the architect Benedetto da Maiano in 1470/72, the walls should have been decorated with a cycle of frescoes representing illustrious men, symbols of civic virtues. In 1482 the Signoria commissioned the work to the greatest artists of the time: Ghirlandaio, Botticelli, Perugino, Pollaiolo, but unfortunately most of them did not have the time to commit to such an extensive work once again (after the Sistine Chapel), only Domenico Ghirlandaio succeeded and finished his work: the decoration of one wall of the room. Therefore, the other walls and ceiling were decorated with the fleur-de-lys, it started more like a trick and it ended up being a tribute! In this very room it is interesting to see, below the fresco, the original Medieval windows of the Palazzo before it was extended. Ghirlandaio's frescoes were executed in 1482, the central scene represents the apotheosis of Saint Zenobi, first patron saint of Florence, and the deacons Eugene and Crescentius and is opened by the two flags of Florence. 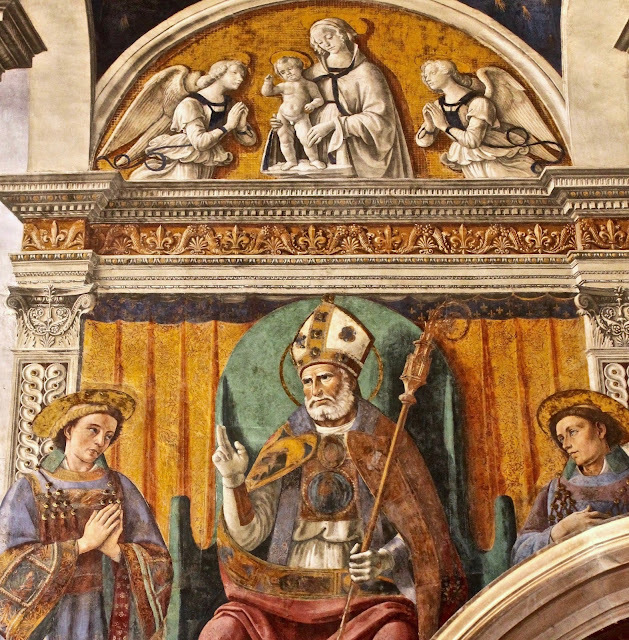 The scene has a beautiful Renaissance perspective background that opens on a blue sky, we can recognise the Duomo, with Arnolfo di Cambio's original façade. 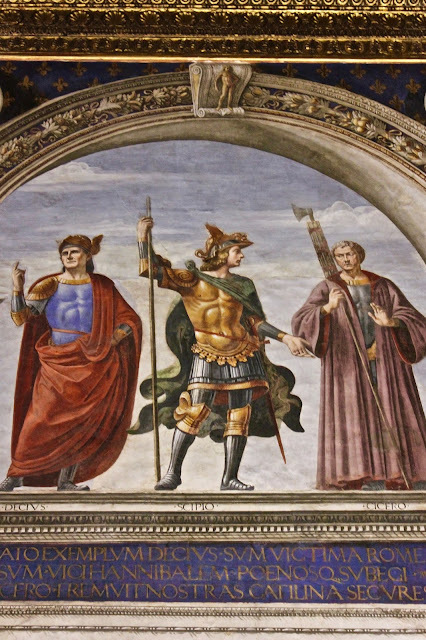 The lunettes at the two sides of the central scene represent: Brutus, Mutius, Scævola on the left and Decius, Scipio, Cicero on the right. 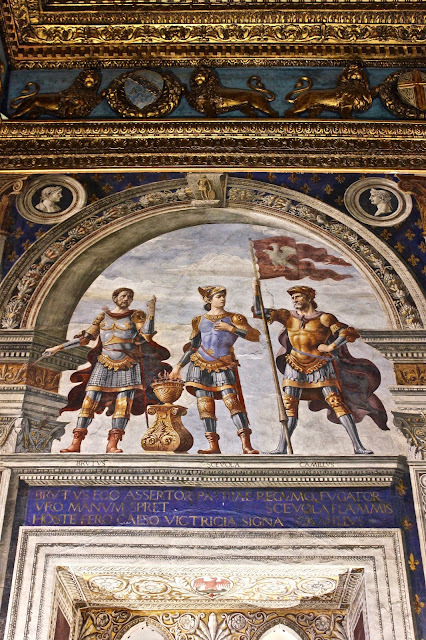 Medallions with portraits of the emperors are in between the painted pilasters that separate the scenes. 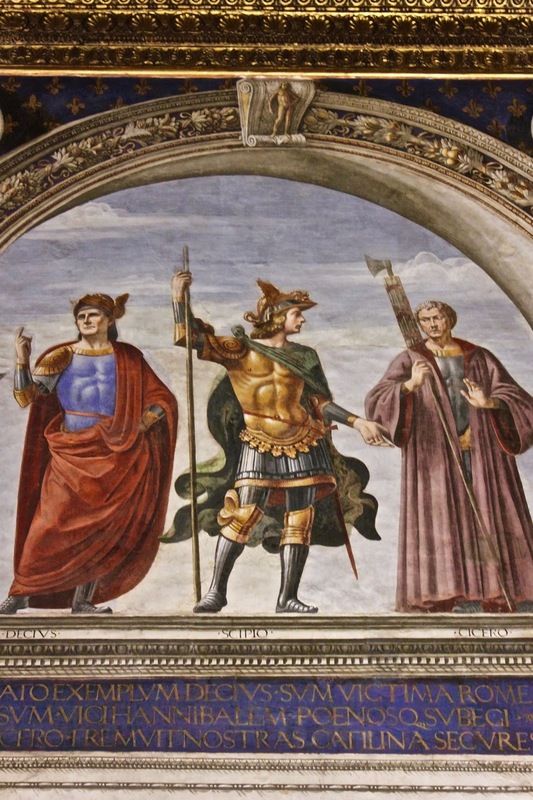 The whole scene has obvious classical references as this was a very popular fashion during the Renaissance, especially as Florence was seen as the new Rome. In the upper lunette is a sort of Della Robbia style Madonna and Child. 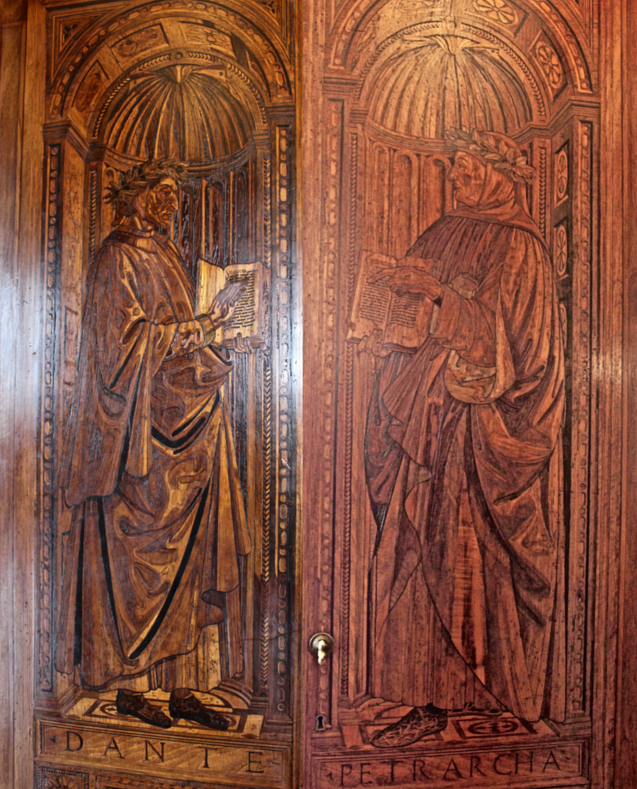 The room has also some other important "details" such as the carved doors with the poets Dante and Petrarch by Benedetto and Giuliano Marzocchi. In this room there is also Donatello's Judith beheading Holofernes, previously in the piazza and here since 1988.